Training Treasures: 8 FREE Bingo Boards, plus lots of new Youtube videos! 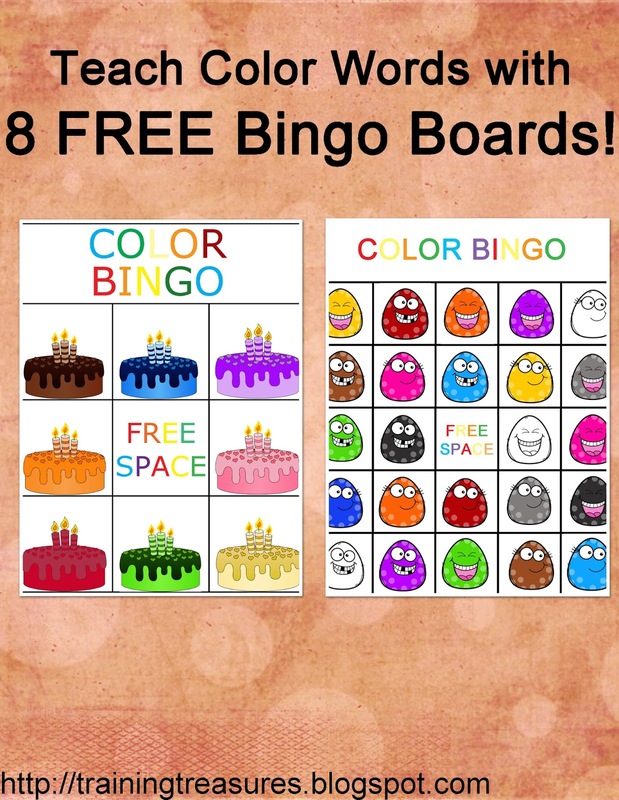 8 FREE Bingo Boards, plus lots of new Youtube videos! 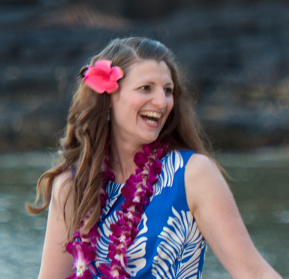 It has been a long time since I've blogged! But after experiencing a bit of mom burn out (you too, huh? ), I remembered that I need time for ME. And for me, that's creating! Sometimes I sew. Sometimes I cook. Sometimes I write music or books. But lately, I've been creating free printables for YOU. I can't just sit around and make myself happy. I'm not happy unless I'm serving others in some way shape or form! And friends, that means I'm here to serve YOU. Lots of things are happening behind the scenes of Training Treasures. My baby and middle boy are both getting ready to have birthdays! Colin will be 4 in November. Oliver will be 1 in December. (Insert tears here!). That means my middle boy will be in K5 next year, albeit homeschooled. And my baby will be walking around the New Year! It is so fun being a mom! As for me, I'm as busy as can be serving as the music director of my church. I am in charge of a LOT, and although the first part of the year had me in tears over this huge responsibility (on top of mothering three small boys), I've adjusted just fine. I've even been taking piano courses and teaching the piano. One of my students is a very special 6-yr old boy dear to my heart . . . I've also just posted our first video of our week in review. Follow me and my boys in our wonderful (and oh so messy) homeschool journey! In this video I show clips of highlights from our week including our trip to the pumpkin patch, pureeing 20 bags (40 cups) of pumpkin, and a reward trip to the park (which includes my son chasing the ducks!) I try to keep things interesting, light, funny, and inspiring. Watch us in action here! Also, I will be recording videos of our monthly large library hauls. My older boys are ages 3 and 6, so if you have young readers, follow us as we share our favorite books that we are using in our homeschool! There is one awesome picture book I feature in this video that you don't want to miss. Make sure you comment below or on my Youtube channel and let me know which picks are also your favorites! We cover about 80 books in this video. As my husband suggested, I am going to slip a link in my blog posts where anyone can donate money for the work of this blog. I would rather offer free printables that people WILL use rather than offer things for sale that just sit there and help absolutely no one. And I'd love to keep my website ad free. I hate ads! If you have been blessed in any way shape or form by the services I've offered on this blog, you may want to send a monetary gift my way. If so, that would be most appreciated! I love what I do and am looking forward to helping others educate their little ones. Today, I am offering a special game for you to play with your emergent reader. It is called Color Bingo. There is an easy version (made specifically with three-yr olds in mind), and a more difficult version. My three-yr old loves to fill up his entire game board. We skip all the Bingo rules and just play until every space is covered! The more advanced version includes 11 colors, and several of them are repeated multiple times. For both games, I used pretty graphics I found on TpT, but tried to keep everything simple yet pleasing to the eye. I wanted my son to be able to focus on the colors and not be distracted by the objects. 1) Easy to play. Draw a card. Have your child read the color word (or read it to them and have them repeat after you). Then, place a gem or rock on the picture that is the same color they drew. Once they fill a row (diagonally, veritcally, or horizontally), they call out Bingo! Reward winners with a treat if you wish! 2) You're drilling your child via flashcards and they don't even know it! 3) Low cost! 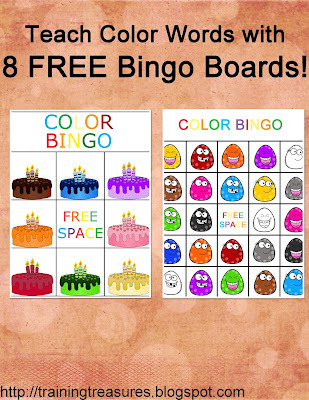 Simply print the Bingo pages on cardstock. You can even print double sided to save on paper cost! Slip into a page protector. I didn't even laminate the Bingo cards themselves. I figure if they get ruined, it's easy and cheap enough to print another copy. Print three copies of the advanced Bingo word cards, and one of the sets of cards for the easy version. 4) Can be used to teach color recognition. If your child can't read yet, or if you have children of multiple ages, this freebie can teach colors and color words. Simply call out the color word to your child, and have them find the correct color on their Bingo board. 5) It really works! My three-yr old is picking up on those color words! It won't be too long before he's mastered these words. Visit my TpT store and download the beginner version here, and/or the advanced version here. I'll be back with more freebies soon! I have some more reading games up my sleeve!